Most of you have seen the infamous Human Tetris video on youtube, and I know this because I was there with many of you haha. Well, since it seemed to be such a hit, I guess they continued. I present to you, Human Tetris II and III!! To go along with this Japanese theme, I also wanted to add this. Again, some of you may already know this, but for those of you who don’t keep up, there will NOT be a Hana Yori Dango season 3. HOWEVER, there will be a final movie with the same cast! This is taken straight from a website/blog: link! It will be released summer 2008 I believe? I’m stoked! hahaha omg i <3 human tetris. HILARIOUS. i dont know how they are expected to do some of them that are like way up in the air. wtf. haha. hyd the movie! ah i hope tsukushi ends up with rui… im prolly just dreaming tho o well im still excited! filming is supposed to take only take 2 months?! keep me updated miss! Yah for the movie! keep me updated! Omg! 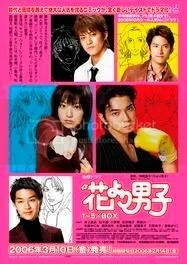 a hana yori dango movie!